The Initial Meeting – This meeting usually take place at your office or via the telephone, and takes about an hour. They are completely free and without obligation. The initial meeting is an exchange of information and ideas. We’ll answer any questions you have, and find out what kind of web site you are planning or considering. The purpose is to provide you with enough information to allow you to decide whether you want to go on to the next step, the writing of an estimate. Estimate Preparation – If, after the initial meeting, you decide to go forward, I will spend more time gathering information, usually by email or phone, and write a detailed estimate for the potential web site. Signing of Contract –Rich’s Web Design prepares a complete contract including a detailed description of the planned web site and a cost estimate. 50% of the total estimated cost is due upon signing of the contract. Keyword Research – The initial phase involves the setting of objectives and goals, a survey of the competition and an idea of your company’s hopes and desires for your web site. Proper analysis of a company’s real needs enables appropriate solutions to be proposed in line with established budgets. Not everyone needs a web site the size of Amazon.com or Microsoft.com . Competitor Analysis – One has to know and understand the competition. What works and what does not work is key. Creation – At this stage, the overall concept of the web site’s presence is established: defining the page look, the navigational ergonomics and the web site structure. Content management needs, together with their technological solutions, have already been taken into account for maximum effectiveness. Feedback – The feedback phase is vital to a professional web site. This will insure accurate representation of your company and be pleasing to you, the owner. Efficient methods allow clients to monitor their projects’ progress stages and to participate to the fullest in the construction of their web sites. Yes, we believe in the philosophy that,”The customer is always right”, … but that still does not preclude us from informing clients as to what will and will not work. We are professionals and give necessary and educated advice when needed. Launch – The launch phase consists of carrying out final checks in terms of technology and use. Optimizing content for the various search engines and services also involves promotion to target audiences, on-line submissions, and the necessity of on-line partnership strategies. Directory & Site Submission – There are still some well know directories or related web sites where inbound links can be requested. Social Networks – Creating the most appropriate social networks is also imperative. Whether it is solely Facebook, Twitter, LinkedIn, YouTube … social networks are here to stay. Maintenance – One of the most important aspects of a website’s success is its evolution and maintenance. Updates should be simplified and adapted to customer needs. Analyzing site usage and new marketing opportunities will ensure a permanent competitive edge as markets and technologies evolve. Content Gathering – Text and graphic content must be gathered before most work can begin on the site. I will prepare a Content Checklist to assist you in pulling together the text, logo, graphics, and photographs needed for the site. Page Layout Drafts – When site content has all been gathered, page layout and visual design begins. The site’s main page is designed first. Rich’s Web Design produces a draft based upon the content, needs, and preferences provided, and uploads this site to a private location on the Internet where the client can view it. The client’s feedback is solicited, and this feedback used to produce a second draft. Once more, client feedback is used to make another round of changes, and these changes are expected to produce a final draft. 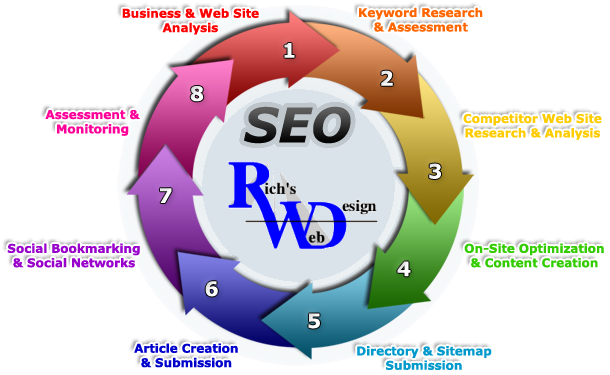 The same process is used for secondary pages, and any other page designs required for the site. Final Site Testing – The site is thoroughly tested. The actual pages are uploaded for the client to review for any minor changes or corrections, and I test the pages on numerous browsers, on different platforms, and at different browser window sizes and resolution settings, correcting any remaining errors. Site Launch – Payment balance is due and the site is uploaded to its own domain and is now “live”.